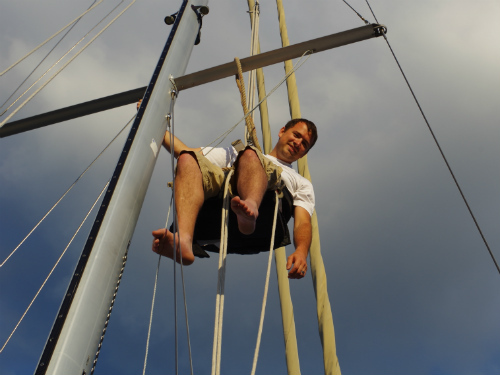 Dan going up the mast for the first time after borrowing a neighbor’s block and tackle. Over the last 3 years of planning, Dan and I have talked with multiple cruisers in person and through email, getting A Little Help from our Friends. Everyone we talked to was more than willing to help us in whatever way they could. It’s only logical that we would see the same kind of spirit in the community once we started living aboard, but to be honest we have been awed by the help we’ve received in these first few weeks aboard. It’s amazing how magnanimous people can be towards complete strangers simply because we are now part of the boating community. As I mentioned in The First Move, Dan and I received our first taste of the friendliness of boaters as we were entering the marina in Stuart. Since we were coming in after hours, there were no marina employees available to help us pull in but we got expert help from other boaters instead. I honestly don’t know if we would’ve made it into our slip safely without the help of Jim and Sandra on Alpha Lady and Gary and Georgette on Two G’s. As we all started introducing ourselves, Georgette brought her cats out and Sandra mentioned that she had been looking for a new cat since their last one had passed a year before. We instantly brought out our cat, Nala, who we had been looking to find a new home for since we had accepted Dan’s new job. She was a good cat, but 2 dogs, a cat, and a 3 year old on a boat was just too much for me to handle. Sandra and Jim instantly fell in love with her and told us that if we were really serious, to bring her over to their boat later that night with whatever cat paraphernalia we wanted to get rid of. We were serious and after grabbing dinner and talking to Carter about the situation, brought Nala over to Alpha Lady (a beautiful 61 foot 1981 Hatteras). Nala would certainly be living in luxury here. Jim and Sandra invited us to stay for drinks and I’m glad they did. After the stress of the day, we were nearing the end of our rope. In fact, if it weren’t for the ability to relax with them and laugh off the crazy events of our car that morning and our difficult parking I believe that we may have thrown in the towel that night. Luckily, we’re still moving and were treated to even more kindness by others through out the next week that we stayed in Stuart. 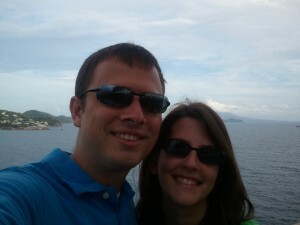 Gary and Georgette on Two G’s were incredibly helpful to us as well. They were parked in the slip directly next door and generously offered their help on multiple occasions. We decided after Friday night on Alpha Lady that we would stay in the Stuart marina until we could hire a captain to help us move the rest of the way to Lantana. However, that left us with the problem that we had no car to get Dan to work on Monday. We had spent Thursday night dropping off our Jeep in Lantana since we believed we would only be in Stuart for one night and we left our Scion in Indiantown. Gary and Georgette graciously offered us the use of their car to go pick up our Scion so that we didn’t have to rent a car for the day. Multiple times during the week Gary helped me to load and unload Carter and the dogs while Dan was at work and even went snorkeling to help me find my keys that I dropped next to the dock! That’s way above the typical neighborly friendliness that I’ve been accustomed to in the past! 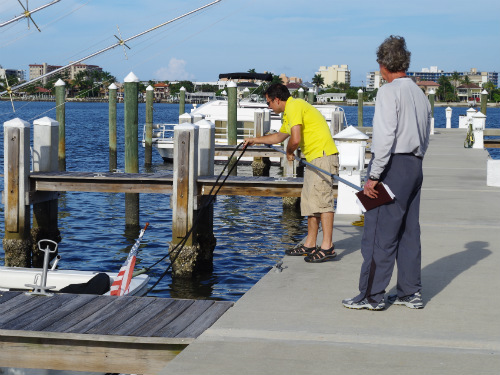 Dan was able to help our neighbor in Lantana park his boat as others had done for us in Stuart. We are very happy to be a part of a community that looks out for each other and was so quick to include us. We hope to be able to “pay it forward” to others in the future.